This Baked Cod Recipe is bursting with flavor! 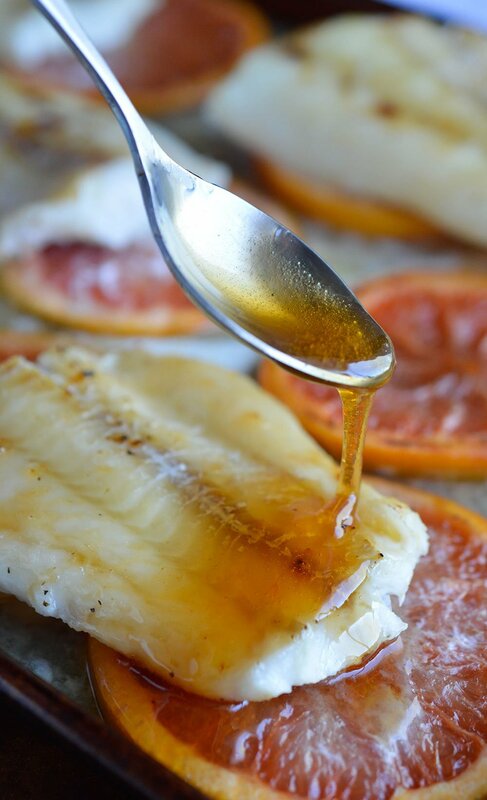 These cod fillets are oven baked on top of grapefruit slices then smothered with a Grapefruit and Honey Glaze. 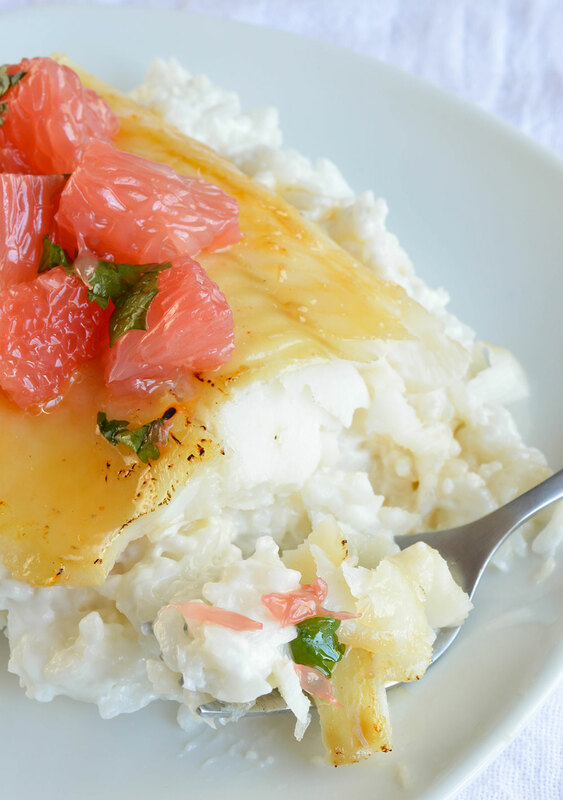 Served with fresh grapefruit salsa and creamy coconut rice. POW! Cod is served at my house on a regular basis. I love how versatile it is. It has a mild flavor with a flaky consistency. 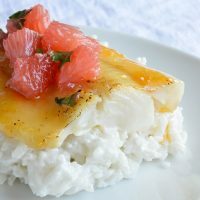 My favorite way to prepare cod is either poached or oven baked. The best part about cod is that it is affordable! It is extremely difficult to find fresh fish in my area. So I buy Wild Alaskan Cod Fillets. They are flash-frozen and vacuum packed to preserve that fresh flavor. Wild Alaska Seafood has lean flesh and firm texture due to the cold water in the natural environment. It is high in protein, low in saturated fat, low in sodium and one of the best sources of heart-healthy omega-3 fatty acids. Most importantly, Alaska’s fishing methods are anchored in strict conservation practices. That means our children will be able to enjoy Wild Alaska Seafood when they are adults. Another food that I eat a lot of . . . Grapefruit. I eat grapefruit every day. 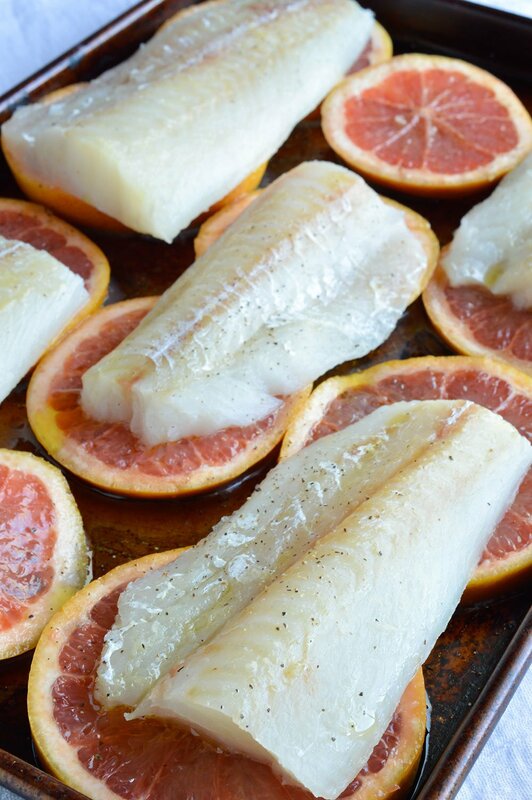 I knew that I wanted to make a baked cod recipe with bright citrus flavor. So I went with my favorite fish and citrus. This combination is unbelievable! The Cod is flaky and baked to perfection. The sticky Grapefruit and Honey Glaze brings a lovely sweetness. Grapefruit salsa adds a bit of tang. And the Creamy Coconut Rice brings it all together. Don’t let fish intimidate you. Anyone can make this! Once you make this Glazed Cod, try the many other options that Alaska Seafood offers. With five species of salmon, several varieties of whitefish, and numerous shellfish species, Alaska offers mouthwatering seafood options for every taste and cooking method and is available fresh, frozen and canned year round. 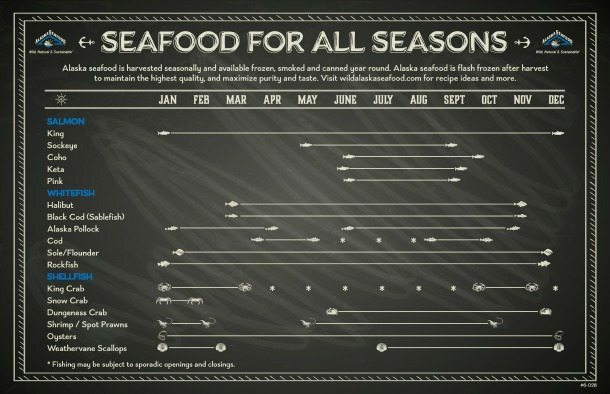 Check out this Alaska Seafood harvest calendar for a reference. . . I bet that sauce is amazing!! Looks so good. Wow, what an impressive recipe. I love that glaze. Pinned. I agree, cod is so versatile and adapts to whatever flavors you add to it. I love the sweet and savory combo you have going on here! I am always excited when a new fish recipe enters my stream. My name is Shannon and I have lived in Alaska my whole life. Fishing is something that is in our blood at an early age. I have friends from out of state that will trade coconuts for me to take the fish off of the hook for them. And I like coconut, so.. Here in Alaska, we also have local honey, which I happen to have a bottle of that has been begging me to find use for (it’s just so pretty in that fancy little bottle:). Tis the beginning of the fishing season here in Alaska, and I imagine this recipe will be tasted by my family and friends. One of my favorite fish to fill up my freezer is Alaska Halibut. The other day, I had the privilege to try a local chef’s Coconut/Buttermilk crusted Halibut with a Coconut Curry Sauce. Yeah, I know. Thank you for the recipe Nicole. I just cam across this recipe on 1/1/2019 HAPPY NEW YEAR! I buy wild cod in mass & cut 3-4oz pieces & freeze so I can pull out what I need each week. It is winter & in my area (VERY Northern CA), we have loads of Meyer lemons & little oranges (satsuma & tangerines) & Cara Cara readily available. I like to use what is literally right out my door. That to say come summer, I’ll be recalling this recipe to use again with the pink & white grapefruit we have ready! WOW! This is so easy & will definitely be incorporated into my weekly rotation of tasty fish dishes. 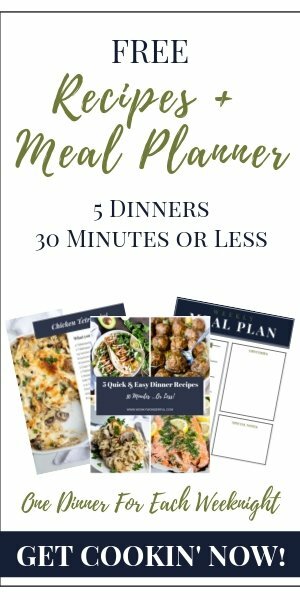 I cook it all at one time so it’s really easy to simply reheat during the week (unless it’s taco Tuesday, then no reheating needed. Just squeeze on some lime & add homemade salsa). Thank you for sharing a really tasty, very easy fish dish most will love. Again, Happy New Year! I’m in VERY Northern CA too 😀 I love a good citrusy cod. Happy new Year!